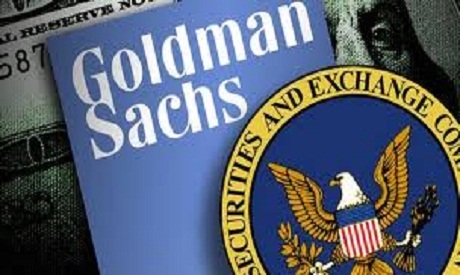 Goldman Sachs and HSBC together held $335 million of the Libyan oil fund's assets, while Societe Generale held $1 billion in structured products for the fund, Global Witness said on Thursday. The campaigning group for development issues said it had obtained a document from 2010 showing theLibyan Investment Authority (LIA) held assets of $53 billion as of June 2010 -- lower than the previous estimate of around $70 billion. The report gives a rare insight into the working of the secretive LIA, detailing the extent of involvement of Western banks in the state-owned fund whose assets have been frozen since March by the United States, Europe and Japan among others. Global Witness said HSBC held $293 million across 10 accounts, while Goldman had $43 million in three accounts, denominated in dollars, pounds, Swiss francs, euros and Canadian dollars. Goldman Sachs and HSBC both declined comment. A much larger portion of the LIA's deposits, $19 billion, was held in Libyan and Middle Eastern banks, including Libya's central bank, the Arab Banking Corporation and the British Arab Commercial Bank. Almost $4 billion of the LIA's funds were placed in structured products. Societe Generale managed $1 billion, JP Morgan $171 million and U.S.-based asset manager OCH-ZIFF $329 million. The document also showed the LIA owned billions of dollars of shares in blue-chip companies such as BP, Deutsche Telekom, General Electric and Vivendi. Much of the LIA's assets have been frozen after the United States and Europe imposed financial sanctions in March, following an earlier embargo on money held by leader Mummar Gaddafi and his family. The LIA was set up in 2006 to manage the country's oil revenues. It owned stakes in a clutch of European blue chips including Italian bank UniCredit to British publisher Pearson.